Coming to university can be an exciting and rewarding time. It is also a time of change which can be stressful and a range of difficulties and dilemmas may arise that can affect your life and studies. Talking to a trained professional can help. Once we receive your referral, we will offer you an initial assessment via email. Please be aware that our emails often go to people's junk email boxes so please check there regularly. The initial assessment will provide an opportunity to explore your reasons for contacting the service, and help build up a clearer picture. The practitioner who is meeting with you for the initial assessment will then discuss next steps with you. For some students using our service, one or two sessions are all that is needed. For others, up to six sessions, in addition to the initial assessment, allow issues to be explored in greater depth. Sometimes a referral to another internal service or an external organisation is appropriate. While you wait for your initial assessment, (or as a one-off appointment) you might find it helpful to attend one of our drop-in sessions. 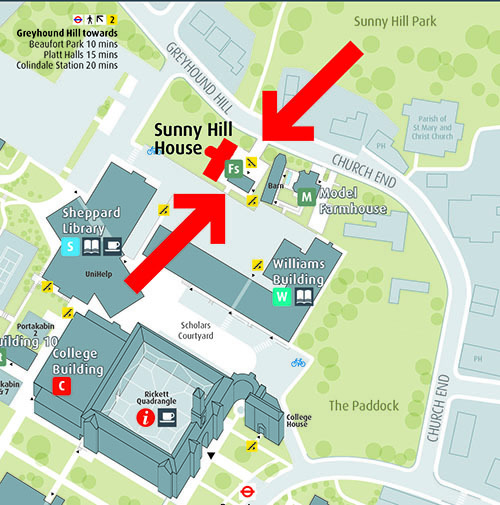 If you are feeling distressed, anxious or have a concern you would like to discuss, come and talk to one of our professional staff by just turning up at Sunny Hill House between 2-3pm, Mondays to Fridays - no need to book an appointment, but please bring your student ID along with you. Stressed? Worried? Feeling low? Having difficulty sleeping? Not feeling good about yourself? Middlesex University is now offering SilverCloud to all registered students and staff, a free online self-help service to help anyone experiencing a variety of emotional challenges. SilverCloud offers secure, immediate access to online CBT (Cognitive Behavioural Therapy) programmes tailored to your specific needs. It can support you in setting goals, problem solving and building up your life skills. These programmes have demonstrated high improvement rates for depression and anxiety. It’s flexible – access it anywhere, on your computer, tablet or mobile phone and work at your own pace. The University runs a series of webinars to support students with overcoming procrastination, isolation, anxiety and mindfulness. First year wellbeing webinars – what makes it hard to ask for help? This webinar will give you the opportunity to hear about some of the common concerns for new students and the issues you experience with getting help. Postgraduate Research Degree webinars – we’ve created a series of webinars specifically designed for those currently on a Postgraduate Research Degree. For full details, please see towards the bottom of the Research Training and Development page. Please email our team administrator at: cmh@mdx.ac.uk or call 020 8411 4118 for more information. Contact the University's Disability & Dyslexia Service at: disability@mdx.ac.uk for information.